Ice Wraiths are hostile frost spirits. They fly quickly, circling the player and attacking with strong frost-based attacks, and are generally found in snowy, cold areas. They are attracted to standing stones and other Nordic ruins that dot the landscape of Skyrim, as well as The Midden below the College of Winterhold. They are vulnerable to fire attacks. Also, due to their wispy nature, they have a tendency to ignore the landscape, and can become stuck or die on elevated areas. 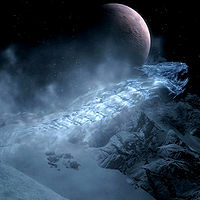 Ice Wraiths can often be encountered in the snowy regions of Winterhold and The Pale.